Update: Unfortunately, the Subtopia slot is no longer available. 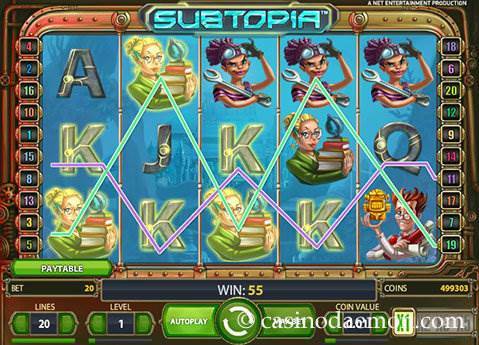 Subtopia from Net Entertainment is an underwater game that takes the players deep under the sea in a vintage submarine. The symbols include the submarine crew, such as the diver, navigator, technician and the captain. The background sound effects are in line with the theme and the quality of the graphics is simply amazing. The developer has put much thought into the detail of the images and the slot game is great fun to play. 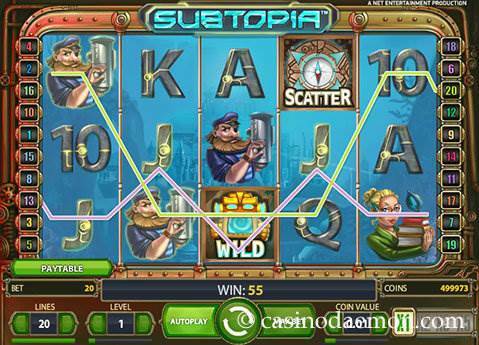 The immersive underwater slot game does not only entice with its graphics, but also with the available features. Players can get a random multiplier, free games and wild symbols to help them win up to 120,000 coins in one game round. When playing the game you will probably experience some rounds during which you're not winning a lot. The game should be played for a while longer, at least until you make it to the free spins, as most money will be probably won there. However, it is possible to win some decent amounts in the base game too. The theoretical return to player is 96.1%, which is relatively low for a Netent game. 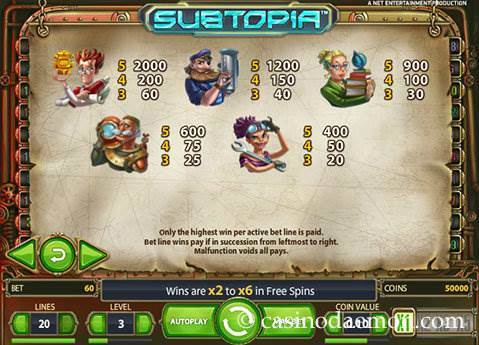 It is also possible to play Subtopia on mobile devices, such as Android and iOS smartphones and tablet computers. It is part of the Netent Touch game series. The wild symbol substitutes for other symbols to complete winning combinations, but not the scatter or the multiplier meter symbol. In each game round a random win multiplier of between x1 and x5 is selected. This means that you can get up to 5 times the line win! The scatter symbol triggers the free spins when you manage to get 3 or more anywhere on the reels. You will also get an instant win applied to your winnings, and how much it is depends on how many scatter symbols you get to show: 2, 3, 4 or 5 scatters give you a multiplier of x2, x4, x25 and even x100 for 5 scatters. During the free spins a multiplier meter will apply a randomly chosen multiplier of between x2 and x6 to the win. The amount of free spins is unspecified and the they will continue until the multiplier meter hits the red crossbones. 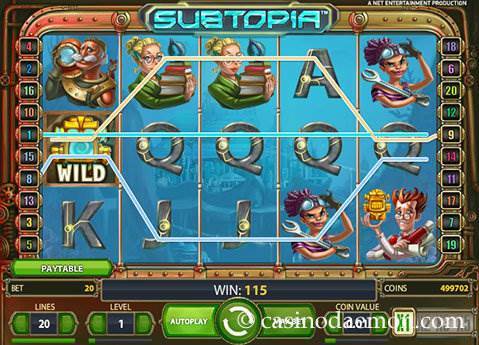 The 5-reel slot Subtopia from Netent has 20 pay-lines that can also be played individually. The coin values range from 0.01 to 0.50 £/$/€, and you can play up to 10 coins per activated line. The minimum you have to play in one round is therefore 0,01 £/$/€ and the maximum 100 £/$/€.